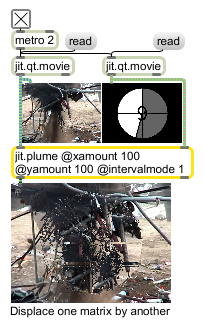 The jit.plume object takes two input matrices. The object analyses each incoming cell of the second matrix and, based on the average value of its planes, displaces the corresponding cell in the first matrix. x_interval int Equivalent to xinterval. y_interval int Equivalent to xinterval.